I’d never had much interest in USAF aircraft of the 1950s. I grew up during the Cold War, so I’ve always had an affinity for the aircraft that flew during the 1970s and 80s. Then I visited the National Museum of the United States Air Force in 2015 and really studied these old aircraft up close, and I was hooked. There’s something intriguing about the raw functionality of those aircraft, their almost primitive nature (that is, primitive compared to an F-22, not a Wright Flyer). You’re probably familiar with the aviation-themed movies from the 1950s. 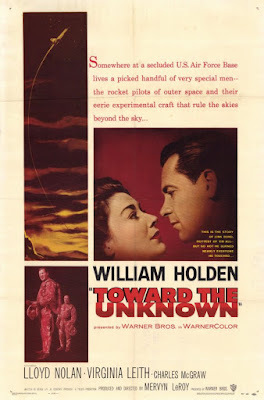 Strategic Air Command is probably the most famous and has received a good deal of buzz over the last couple of months with its release on DVD, but another notable movie is Toward the Unknown, starring William Holden and Lloyd Nolan. The movie was based on a novel by Beirne Lay, who went on to write the screenplay for another aviation movie, Above and Beyond, as well as Strategic Air Command. Movies like this don’t have much of a plot. This one sees a broken fighter pilot make his return to the air at Edward AFB’s Flight Test Center thanks to the support of an old flame. Pretty boring stuff. Movies like this are worth your time just for the flying footage. If the B-36 and B-47 were the stars of Strategic Air Command, the weird and unusual XB-51 (dubbed the XF-120 for the film) is the star of this one. It’s a huge, ungainly aircraft — one that we almost never see or talk about — so watching it climb and dive is a real treat for enthusiasts like us. You’ll also see the F-100 and F-102 in flying sequences, and too many 50s era aircraft on the Edwards flightline to count. It’s interesting to note that only two XB-51s were manufactured, and one crashed on its way to Eglin AFB for filming of the movie. Check out the Turner Classic Movies web site for future airings of the movie. DVR the movie and fast-forward through the non-flying segments. The return to flight after POW torture is based on Bud Mahurin, a WW II and Korean War ace who signed a "Confession" after being tortured as a NK POW. The rocket test stands in the movie are still there, visible from Hwy 58 east of Boron. All time great airplanes in that movie, only one comparable for variety is Errol Flynn's Dive Bomber from 1940.